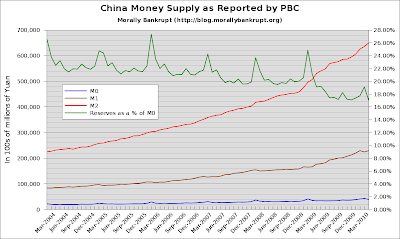 Hot on the heels of my complaint about the People's Bank of China not publishing money-supply statistics, the numbers have been published to their Chinese-language website, although still no 2010 data in the English-language version. It's becoming clear that there is evidence of overheating, although--as the second graph suggests--the government's efforts in slowing down gr﻿owth have worked. 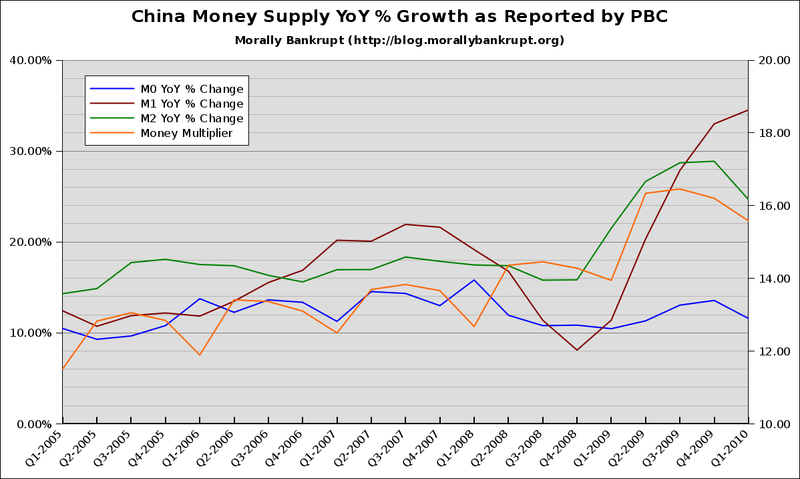 In particular, the changes seen between Q1-2009 and Q2-2009 are indicative of overheating. Particularly notable, the M1 changes seen in the last 3 quarters signal the credit-expansion I was referring to last time I wrote about China. The fact that M1 is still growing at an accelerating pace is worrysome. Just today, Bloomberg reported increasing inflation, hot on the heels of monetary tightening over the past couple of months. While this might sound counter-intuitive, it is well-covered by "Charles" on M Pettis' website. Part of his point being that when people are working towards a target sum by a certain date, lowering the discount rate will only serve to increase the savings rate as people have to make up lost interest income, or that when people have most of their savings in bank deposits instead of other assets, a decrease in the discount rate will have a negative wealth effect. That neat little digression aside, the point I am trying to make here is that these cultural differences in saving and spending behavior coupled with fears about declining purchasing-power of money could lead to an increasing demand for hard-assets, leading to additional upward pressure on prices. 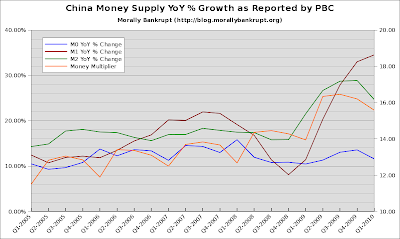 For now, though, I still think the Chinese "real-estate bubble" is a little too hyped up. Their banking rules require lower LTVs and their bank reserve-requirements are higher, making a US-style housing implosion unlikely. Asset prices may drop or stagnate, but I doubt a full-on implosion leading to a banking crisis is possible without the fuel provided by zero-downs, neg-ams etc. What I would love to see is some data as to what % of bank assets real-estate backed loans compromise and their average LTV. If one is to find evidence of a bubble or lack there-of, it'd be there. 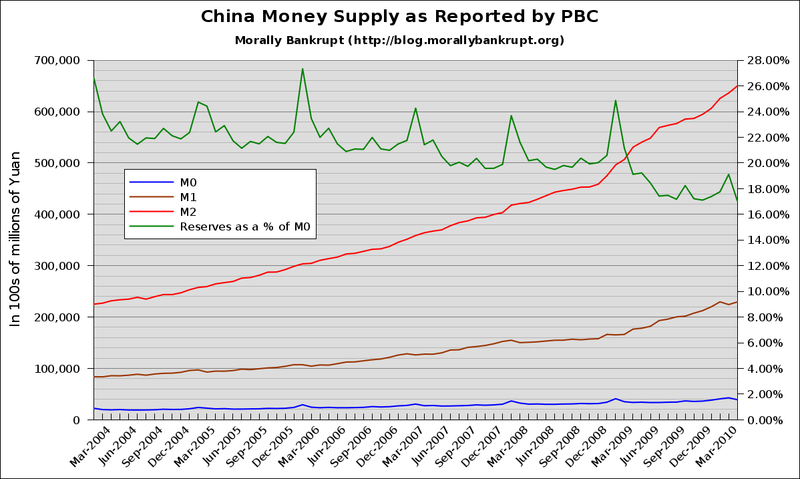 This is a good sample for the finance status of China. It would be a good idea to post it here. Spending a lot is a problem, so save and have some money for the future. Thanks for this wonderful post that is educational for all readers. Wow amazing, Nice content I found so many interesting stuff in your blog especially its discussion.For more info click this link.